The MedChain offering is now closed and is no longer accepting investments. "MedChain is pioneering a community-driven solution to the burgeoning field of Electronic Medical Records (EMR) and electronic Protected Health Information(ePHI). Our goal is to put control back into the hands of the patient -- both literally and figuratively. We believe the use of MedChain's cutting-edge blockchain protocol technology, military-level encryption and distributed storage coupled with an open-source framework will create a level of security poised to become the new standard in HIPAA compliant medical record-keeping. Invest in MedChain as we aim to revolutionize how EMRs are stored, accessed and utilized, significantly benefitting both healthcare providers and patients. Funds from this crowdfunding campaign will be used for marketing and PR initiatives that will raise awareness of MedChain's product offerings and will fund development of MedChain software, blockchain and smartphone applications. We are currently in a testing stage and developing our blockchain in-house and will begin phone and web application development after finalizing our funding round, aiming for a late 2018 internal beta launch"
$2/Share of Common Stock│When you invest you are betting the company’s future value will exceed $21,000,000. When you invest in our Pre-ICO, your SAFT will be redeemable for Utility Tokens equal to twice the amount of the final purchase price. For example, an investment of $500 will entitle the investor to $1000 worth of Utility Tokens. MedChain's mission is to use blockchain technology to establish a better, more secure and transparent framework for Electronic Medical Records that vastly improves the quality of care for patients and helps reduce healthcare providers' costs. Current EMR systems as centralized silos with limited communication capability, inadequate transparency and a lack of interoperability. These infrastructure problems can be solved by Medchain's blockchain network. The 21st Century Healthcare system requires interoperability - the ability of computer systems and software to exchange and make use of key patient information, allowing primary healthcare providers to communicate with additional providers such as labs and pharmacies. But currently-available Electronic Medical Record (EMR) systems might not follow the patient between providers and might not facilitate effective communication. Source. These outdated infrastructures can increase information delays and costs while decreasing the overall quality of care. From the patient's perspective, it can limit the access and control they have over their medical information including how it is used. By implementing the MedChain infrastructure, we believe that healthcare providers will have access to a vastly more secure storage and transfer mechanism due to the frictionless connectivity, transparency and cybersecurity of the blockchain. Our hope is that this will ultimately improve the overall exchange of health information. Utilizing MedChain's blockchain and software, heathcare providers can have near-instant access to medical records of new patients, and could potentially save several billion dollars each year in fines associated with data breaches. In addition to significant savings, patient information can also be kept secure with extremely reduced risk of identifiable data being leaked. That's the kind of data security that the blockchain can provide. Utilizing MedChain's smartphone and web applications, patients will be able to eliminate and/or avoid redundant testing due to lack of record-sharing between providers. Health records can also be near-instantaneously available in cases of emergency, including when the individual is non-responsive but has their smartphone on them. The MedChain Patient Application is being developed for iOS and Android smartphones, tablet and desktop use, always providing the most up-to-date information, such as medical test results as well documentation all patients are entitled to under HIPAA and EMR guidelines. The MedChain applications will also notify users of access requests from service providers, doctors, hospitals, and health insurance providers. The MedChain Patient Application will function as a wallet of information tied to the patient’s unique public identifier and is accessible only with the patient's unique private key. When information is requested from any of the user's platforms, their private key will be used to decrypt the information. Utilizing an intuitive, user-friendly interface, the MedChain Patient Application allows the patient to designate access to private health information, including information tied to their account that might be available only to specialists, such as psychological records and evaluations that even the patient cannot see or utilize. Through further development, additional functions will enable the patient to upload their own data. As a key feature of our approach to healthcare the MedChain Patient App will be available as a no-cost downloadable application through app stores and available as a Web App on the MedChain website to encourage provider adoption of our Service Provider Software and blockchain technology. The MedChain Service Provider Software will function as an automated intermediary of interoperability between the provider's current HIPAA-compliant software database and the MedChain blockchain and distributed storage network. While some functions already exist to encrypt data prior to distribution, MedChain is developing additional ways to ensure encryption before transmission. Following encryption of electronic Private Health Information, the MedChain software will hash the information and create defined chains of entries to the blockchain as a functional way of verifying data integrity and eliminating the chance for foul-play or unauthorized data manipulation. MedChain’s Software will function as nodes authorized and federated by MedChain, requiring zero on-site upkeep. The MedChain Service Provider Software will be marketed at a low-to-no-upfront cost to providers based on a SaaS model that requires a subscription to use the software and access the blockchain. This subscription may be integrated with internal token usage or kept separate. Token usage to add information to the MedChain blockchain is imperative to our business model. To upload information to the network, a purchase of either external and transferrable MedCoins or internal non-transferrable Entry Tokens (ET) must be made. Entry Tokens function as credits within the ecosystem, keeping their price tied to a fiat currency and allowing providers to access the blockchain without concern over volatile cryptocurrency for data uploads. 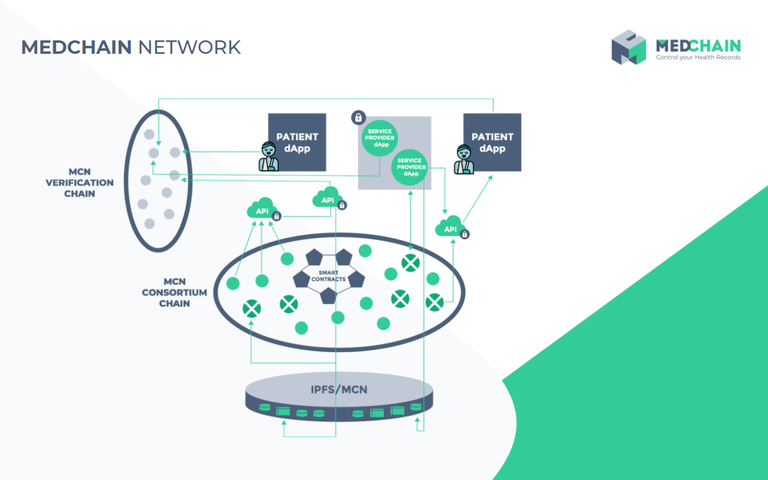 The MedChain Network protocol is based on a Data and Application Layer integrating an ERC20-Standard token on the Ethereum Blockchain, working in a distributed and decentralized manner. Mining, data validation, data storage, proof-of-storage and proof-of-retrievability will be provided by a network of decentralized and MedChain-federated servers as part of the blockchain protocol in conjunction with MedChain software (via both patient & provider apps) for trading MedCoins, converting MedCoins to Entry Tokens, and to ensure payment for blockchain Entries. 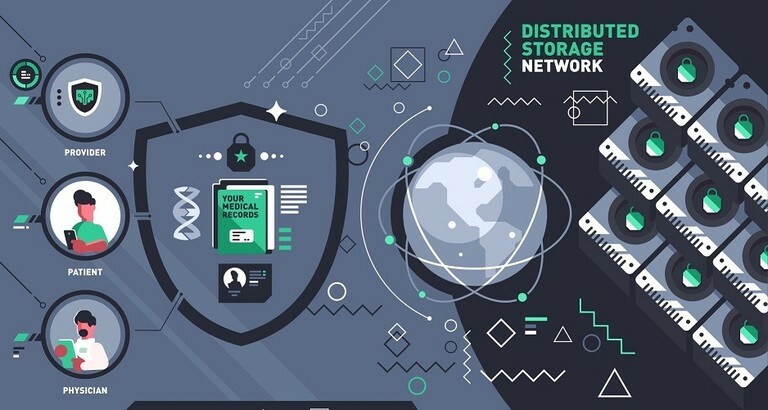 The MedChain blockchain will function as a hash depository for the decentralized storage network, which will be fully auditable and verifiable by a network of federated servers. The federated servers will be paid with MedCoins in return for storage space and retrieval of information. All storage and retrieval requests will function with the use of Entry Tokens rather than MedCoins. Federated mining nodes will be compensated with MedCoins for executing valid and verified transactions. The MedCoin is being created as the driving force behind the MedChain infrastructure. For both users and patients, this token functions as the key to the system. Their MedCoin can be exchanged for Entry Tokens (ET) to facilitate data uploads and serve as a gatekeeper for access requests retrieved through the MedChain API. Healthcare organizations will use MedCoin by exchanging them for Entry Tokens, providers will not only purchase space allocation but also use MedCoin for patient records access-request through the MedChain API. MedCoin may eventually also be used to purchase rich anonymized data which could be analyzed for diagnosis automation or other uses. Finally, MedCoin is used as rewards for HIPAA-compliant storage space providers, distributed mining payment cycles, and federated server reimbursement. We believe in a token-connected world, where medical and healthcare services can be driven by MedCoin on the MedChain infrastructure. In addition to being inefficient, today's EMR systems are fraught with risk. These systems are regular targets of fraud and sources of data breaches that not only jeopardize patient confidentiality but also cost healthcare providers significant resources annually. A large proportion of these readmissions are the result of the insufficient coordination in today's EMR systems. MedChain is paving the way for an evolved EMR system that far surpasses these inadequacies by providing the best solution for both patient and healthcare provider. In 2015, there were over 250 instances of EMR data breaches in the United States. The majority of these incidents were the result of hacking, however non-intentional IT incidents were the cause in many instances as well. In March of 2016, 21st Century Oncology reported that the records of 2.2 million patients were hacked, which has resulted in a large number of class action lawsuits against the practice. Regardless of how the data was breached, these violations of patient confidentiality affected over 112 million Americans. The penalties and fines associated with these incidents cost American healthcare providers over $6 billion in damages annually. MedChain, Inc., a blockchain technology company focused on protecting electronic health records and the flow of information between patients and their physicians, hospitals, and health insurance providers announces the formation of their company and participation in the StartEngine November 10th. An early stage blockchain technology company focused on protecting electronic health records and the flow of information between patients and their physicians, hospitals, and health insurance providers announces development of its first proof of concept blockchain. At this point, everyone and their mother has heard of Bitcoin, even though no one seems to be able to really explain it. It all seems to come back to a vague notion of this thing called blockchain, which sounds cool … but what is it? And why should we in the medical world care? Investors will receive a number of tokens equal to twice the value of the investment amount. For example, an investment of $500 will entitle the investor to $1000 worth of tokens in accordance with the terms of the future token generation event. The tokens will vest and be delivered approximately 120 days after the official launch of the token generation event. The Company does have a distributed ledger based business model but not yet a blockchain based utility token and there is no guarantee that such will be developed in the future. The promise of future tokens is contingent upon the successful development of such items. There is no guarantee that successful development will ever occur. The right to receive future tokens and the offering of future tokens is being offered as part of this offering exempt from registration under Regulation CF. Description of Future Utility Tokens. The Company is including as part of this Offering the right to receive future utility tokens when and if the Company creates a network based upon blockchain and distributed ledger technology. The utility tokens may be used within the network to purchase entry credits facilitating Electronic Medical Record storage and access control. The tokens may also be exchangeable upon cryptocurrency exchanges. The Company has immediate plans to create a distributed ledger technology offering. Therefore, the rights offered and issued in connection with this offering are contingent upon the development of such technology. Investors in this offering should not plan on receiving such tokens and should not include any such future utility tokens as part of their investment decision. Any future utility token shall only have a use within a developed ecosystem and shall not be considered debt or equity in the Company. MedChain, Inc. will offer 10% additional bonus shares for all investments that are committed by StartEngine Crowdfunding Inc. shareholders (with ≥ $1,000 invested in the StartEngine Reg A+ campaign) within 24 hours of this offering going live. StartEngine shareholders who have invested $1,000+ in the StartEngine Reg A+ campaign will receive a 10% bonus on this offering within a 24-hour window of their campaign launch date. This means you will receive a bonus for any shares you purchase. For example, if you buy 50 shares of Common Stock at $2.00 / share, you will receive 5 Common Stock bonus shares, meaning you'll own 55 shares for $100. Fractional shares will not be distributed and share bonuses will be determined by rounding down to the nearest whole share. Multiple Closings. If we reach the target offering amount prior to the offering deadline, we may conduct the first of multiple closings of the offering early, if we provide notice about the new offering deadline at least five business days prior (absent a material change that would require an extension of the offering and reconfirmation of the investment commitment). The Company might incur Irregular Use of Proceeds that may include but are not limited to the following over $10,000: Any expense labeled "Administration Expenses" that is not strictly for administrative purposes; Any expense that is for the purposes of inter-company debt, back payments, or reimbursements. MedChain working with RedCrow for accredited investor round! MedChain is proud to be presenting our Regulation D offering on RedCrow for accredited investors, a platform focused on healthcare startups! Follow us as we get ready to launch our next offering at RedCrow. MedChain and Trustroot Partner to Secure Electronic Health Record Transactions on the Blockchain. 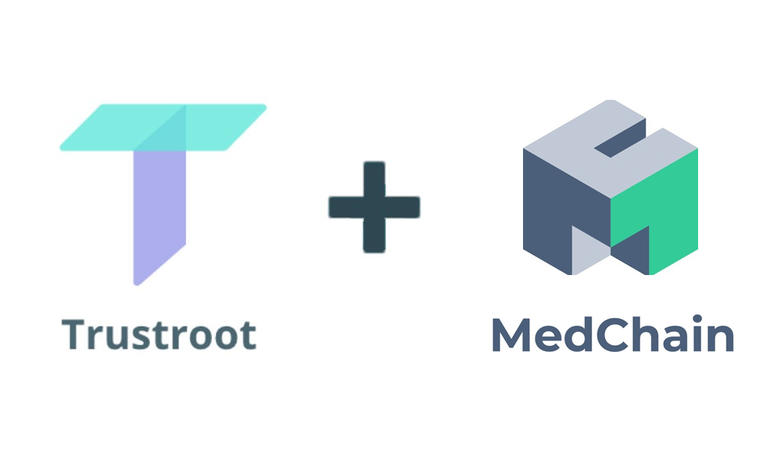 MedChain, the leading blockchain electronic health record platform is excited to announce a new partnership with the leading blockchain security protocol, Trustroot (www.trustroot.io). This partnership will allow individuals who use the the Medchain’s platform to be fully confident in the validity of their transaction. With the high rate of fraudulent activity happening within the blockchain community, the addition of Trustroot’s verification will provide customers peace of mind while protecting them from phishing attacks, malware, and other advanced cyber threats. MedChain’s mission is to use blockchain technology to establish a better, more secure and transparent framework for Electronic Medical Records (EMR) that vastly improves the quality of care for patients while reducing healthcare providers’ costs. This allows companies and individuals to build software and applications within a globally compliant framework facilitating secure storage and transparency. Learn more about the project at www.medchain.global. Trustroot is a blockchain protocol that protects individuals and businesses from fraud and theft within the cryptocurrency community. The protocol verifies the identity and trustworthiness of the blockchain business users interact with to help them avoid scams, phishing attacks, and other fraudulent activity. Learn more about the project at www.trustroot.io. We're happy to announce that today, we have teamed with IBM Business Partner - Cognition Foundry, to capitalize on the unprecedented data privacy, security capabilities, and performance of IBM LinuxONE mainframe and Power Systems to enhance the solutions MedChain is offering to address important challenges in healthcare using blockchain technology. Cognition Foundry enables visionaries to use extreme computing power for the good of society. They have offered a LinuxONE platform to the MedChain developers to create a blockchain and analytics solution that will very quickly grow to millions of users reliably and securely. Providing innovative startups like MedChain access to Enterprise scale computing power benefits patients and providers alike as they enjoy the same levels of security and performance that have previously only been available to mega-corporations and secretive government agencies. No extension, last chance to get in! Investors and followers; After further communication with StartEngine it became clear that even if we extended our offering for another month it's unlikely the Escrow company and StartEngine would be ready to allow crypto-investments for Regulation CF offerings. We're very disappointed it couldn't get done, but understand that adhering to regulations is of paramount importance. As the most successful security token 'pre-sale' filed as a Regulation CF offering with the SEC to date, we're excited for what the future holds... development is well underway and our CTO Steve Wishman has been busy finishing our architecture and assembling his team of developers/engineers. Some of you may have noticed a few changes to our webpage; in anticipation of our Regulation D 506(c) offering we're introducing a new look and will have our updated White Paper available in approximately 2 weeks, along with a iOS/Android Demo in approximately 5 weeks. Thank you for believing in us! We're excited to deliver a solution to a massive real-world problem! Last chance to get in before the millionares, time is almost up! We'll be announcing some additions to our Advisory Board and will be releasing our finalized white paper in the coming days! Please participate in this poll: https://goo.gl/forms/SG3KGx5qh3IzPoGl2 to indicate whether you believe we should, or should not, extend our campaign to allow cryptocurrency investments. Bitcoin and Ethereum investments in MedChain will be available late next week! Cryptocurrency investing will be available for our offering! We've been informed by the StartEngine team that they are finalizing acceptance of Cryptocurrency investments for our offering! In a goodwill effort they have waived & covered the fees associated with out Form C amendment, which we are using to give investors the opportunity to join the offering with their cryptocurrencies. We have been given a tentative data of April 20th, coinciding with their ICO 2.0 summit in California. MedChain, Inc. is extending their offering. Your opportunity to invest is ending! The next MedChain offering will be for 'Accredited Investors' ONLY! We have hired Eric Lafleche for the role of Chief Marketing Officer. As the Co-Founder of the TradeScout blockchain protocol the former Global Marketing Manager at Budweiser, the eCommerce Lead Innovation Manager at Unilever we feel that he is uniquely equipped as we move toward our accredited investor only raise. Eric also co-hosts the popular cryptocurrency podcast CryptoStarship. We've been working hard on Minimum Viable Product development and hope to have an iOS/Android demo application available at our future events for user feedback. We are excited to be utilizing and integrating FHIR and CDA HL7 v3 standards helping drive international adaptation in an effort to solve the problem of interoperability not just locally, but globally. The problems of health record interoperability is often amplified by borders; communication and sharing between care providers can come to a grinding halt when systems or languages differ. Moving between countries can be a disaster for people with extensive medical histories, a problem that can be eased by instituting a global interoperability solution. The MedChain Distributed Storage Network and governing blockchain will be at the forefront of innovation as we tackle US and world wide Electronic Medical Record interoperability. As you might know, MedChain has exceeded its minimum funding goal. When a company reaches its minimum on StartEngine, it's about to begin withdrawing funds. If you invested in MedChain be on the lookout for an email that describes more about the disbursement process. Chief Technical Officer announcement; come meet us at an upcoming event! We’re pleased to announce that Steve Wishstar has joined the MedChain team as Chief Technical Officer. Steve is an experienced CTO and hands-on Sr. Software Engineer with extensive experience working on projects for NASA Ames, Lockheed Martin and Raytheon. 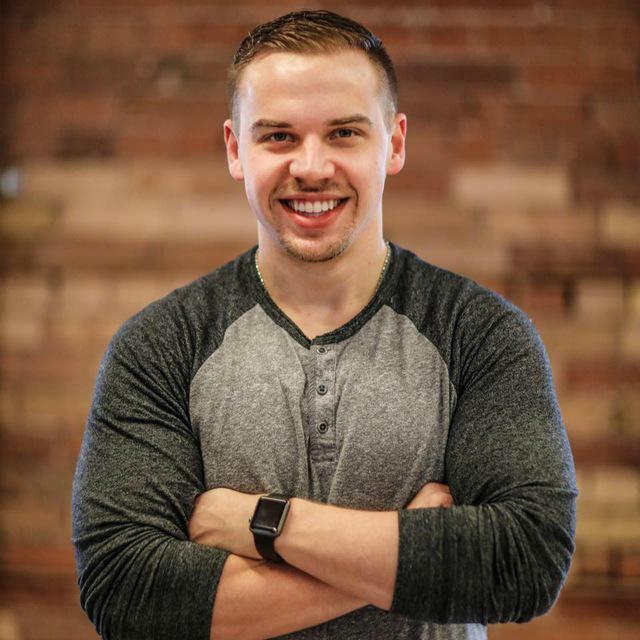 He has a demonstrated history of producing maintainable code, developing automated test driven architectures, and solidifying full-stack integrity; with roles leading teams up to 15 engineers and software/website designers we’re confident he will be an exceptionally valuable addition to the team. He also brings additional patent experience to help protect our IP as development gets further and more proprietary. We’re sponsoring the CU Blockchain Summit at University of Colorado Boulder and hosting a blockchain workshop for students starting to familiarize themselves with this innovative technology. We’re sponsoring the TOKENOMx crypto-conference in Chiang Mai, Thailand which represents our first footsteps into the East Asia market, we’re excited about potential partnerships and relationships this will generate for us. We’re sponsoring the Global Blockchain Summit in Denver Colorado, be sure to get your tickets for the event while they last and come say hi to the MedChain team! It’s our pleasure to present the first two additions to our Board of Advisors! Gene Libov, Chief information Security Officer at CloudMedX and former Director of Security and Technology at Blue Shield of California – Insurance and Health plan provider. We are very excited to have Gene on board; information security should be the top priority of any company dealing with patient data, we’re confident his guidance will be invaluable to our company moving forward. Dr. Erika Beerbower, Clinical Content Specialist at IBM Watson Health. We are equally excited to have Erika on the team; IBM Watson is paving the way for Artificial Intelligence and IBM Watson Health the way for effective care and positive patient outcomes. IBM is currently training Erika in blockchain technology and with nearly 10 years of clinical database maintenance experience we expect her to bring high levels of insight to the team. Remember to get your tickets for the Denver Day4Crypto at www.DenverD4C.com - I'll be there March 10th with Alex Bowman from 8am to 7pm! MedChain has extended their offering for 45 days. We have passed $350,000 in investments, from more than 350 of you! No ‘whales’, no institutions! We currently stand at over 1500 followers on StartEngine alone, and realize many of you are waiting for StartEngine to allow cryptocurrencies like Bitcoin and Ether as investments into our offering. We’re very optimistic that the option will become available soon, as it is for Regulation D 506(c) and Regulation A+ offerings, and will be extending the period that our campaign will be live to ensure crypto holders will be able to participate. We’re excited to have hit this important milestone… so THANK YOU to every investor who has contributed so far, we encourage potential investors with unanswered questions to post them on the offering page. StartEngine still is working with us to get cryptocurrency investments open for our offering and we will be sure to let all of our followers know when they’ve been enabled… As far as we are aware it would make us the first Title III Regulation CF campaign to accept cryptocurrencies. I am still personally working on our blockchain development, but hope to have more hands on the development deck very soon. Thank you again to all of our investors, and to everyone rooting for our success. Day 13 Update – What a response from the community! The past two weeks have been an amazing journey, we’ve received an outpouring of responses from people who have personally experienced the short-comings and lack of interoperability between current EMR systems and are looking for a solution. So far, Doctors from nearly every field of medicine have reached out to talk about the implications of our approach and how it will positively affect patient outcomes, but we’ve also heard from a multitude of Nurses, Technicians, Billing specialist and companies who are eager to find solutions to a common but hard to solve problem; keeping ePHI secure, but accessible when it's needed wherever it’s needed. We’re aware that people familiar with ICOs have traditionally been able to invest using cryptocurrencies and we’ve received word that StartEngine hopes to be able to accept these forms of payment soon. Finally, we’re in the process of assembling our Board of Advisors and hope to make an announcement about our choices soon. Day 4 Update – Thank you and Happy New Year! What a start to the New Year! We would like to give our sincerest thanks to our initial group of investors who helped us reach our minimum offering threshold in less than 1 hour. And now, with almost no marketing, we’ve reached more than 4 times the minimum! There’s something to be said for the draw of blockchain technology, especially when applied to real-world problems and presented by a real company. Beginning today we will be stepping up our marketing efforts to reach more investors interested in the future of Electronic Medical Records and using blockchain technology to protect Patients and Providers alike.